Winterania lanceolata orth. var. Poir. Tasmannia lanceolata (syn. 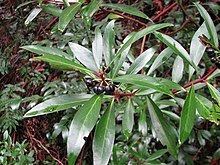 Drimys lanceolata), commonly known as Tasmanian pepperberry, mountain pepper (Aus), or Cornish pepper leaf (UK), is a shrub native to woodlands and cool temperate rainforest of south-eastern Australia. The shrub varies from 2 to 10 m high. The aromatic leaves are lanceolate to narrow-elliptic or oblanceolate, 4–12 cm long, and 0.7–2.0 cm wide, with a distinctly pale undersurface. Stems are quite red in colour. The small cream or white flowers appear in summer and are followed by black, globose, two-lobed berries 5–8 mm wide, which appear in autumn. There are separate male and female plants. Also known as Tasmanian pepperberry, it is found from Tasmania, northwards through Victoria to Barrington Tops in New South Wales. It is found in gullies in rainforest. The leaf and berry are used as a spice, typically dried. Tasmanian pepperberry was used as a colonial pepper substitute. More recently, it has become popularised as bushfood condiment. It can be added to curries, cheeses, and alcoholic beverages. It is exported to Japan to flavour wasabi. The berries are sweet and fruity at first with a lingering peppery aftertaste. Dried T. lanceolata berries and leaves have strong antimicrobial activity against food spoilage organisms. It also has high antioxidant activity. Low safrole clonal selections are grown in plantations for commercial use, as safrole is considered a low-risk toxin. Used in colonial medicine as a substitute for Winter’s bark, a stomachic, it was also used for treating scurvy. Tasmanian pepper is one of a number of native Australian herbs and food species being supported by the Australian Native Food Industry Ltd, which brings together producers of food species from all parts of Australia. The pepperberry can be used as a fish poison. It can be grown as a garden plant. Its berries attract birds, including Currawongs, that feed on them. It can be propagated from cuttings or seed, and can grow in a well-drained acidic soil with some shade, but is sensitive to Phytophthora cinnamomi. ^ “PlantNET – FloraOnline”. plantnet.rbgsyd.nsw.gov.au. Retrieved 11 October 2018. ^ Fairley A, Moore P (2000). Native Plants of the Sydney District:An Identification Guide (2nd ed.). Kenthurst, NSW: Kangaroo Press. pp. 52–53. ISBN 978-0-7318-1031-4. ^ Menary, R.C., Drager, V.A., Garland, S.A., Tasmannia lanceolata – Developing a New Commercial Flavour Product, Rural Industries and Development Corporation, 1999. ^ Ewart, A.J., Flora of Victoria, Melbourne University Press, Melbourne, 1930. ^ www.pagination.com.au. “Australian Native Food and Botanicals”. www.anfil.org.au. Retrieved 11 October 2018. ^ “Fact Sheet: PLANT DIARY: Tasmannia lanceolata”. Gardening Australia Website. Australian Broadcasting Corporation. April 5, 2002. Retrieved 2009-08-12. Bruneteau, Jean-Paul, Tukka, Real Australian Food, ISBN 0-207-18966-8. “Tasmannia lanceolata”. Australian Plant Name Index (APNI), IBIS database. Centre for Plant Biodiversity Research, Australian Government.